HIDEit: Get Your Gear In Order But Good | "DESTROY ALL FANBOYS!" 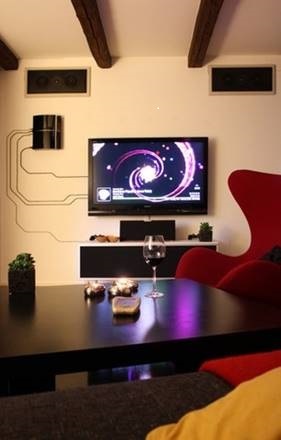 As you can see (or can’t see because they’re so well hidden) HIDEit makes simple but highly functional wall mounts for current gaming consoles, small form factor PC’s and Macs, cable boxes and more. They also have controller mounts and even an optional theft deterrent solution in case you want that extra security. If you’ve got sturdy walls and a TV mounted on one or more of them, you’re an easy HIDEit customer in the making. The great thing is installation won’t take a year of carpentry classes or calling up that creepy-looking “handyman” who slid a misspelled flyer under your door as you were opening it to take out the trash last week. Each mount comes complete with hardware = all you need is a good drill and appropriate bits or a good screwdriver. A level and elbow grease are also beneficial for best results, so some of you scrawny-armed types may need an extra strong arm to shift stuff around. Prices range from $11.99 to $59.99 and I’d bet you a hot nickel that your holiday gift list includes at least ONE person (not including YOU) who needs one or more of these mounts. Okay, you’re up to speed on the HIDEit front, correct? Good. Me, I could use a bunch of them, but I’m in the process of entirely redoing my game cave so I’m still in the “being in awe because I have a ton of games and systems in such a small space and don’t know where to begin” stage. But now that I see what HIDEit can accomplish, it’s a product on my list of things to get once I get myself in gear to tackle a pretty massive project. This entry was posted in 2015, DAF, Features, Holiday Gift Guide 2015, Humor, Updates and tagged Apple, BUY THIS STUFF!, Gear, Gifts, HIDEit, Macintosh, PC, Tech by geelw. Bookmark the permalink.